Cowboy builders, they’ve been the subject of investigations, documentaries and so many others exposes that they’ve become part of the cultural landscape. But these rogue traders are vilified for a reason – they scam people by pretending to be able to do a job they just botch – if they complete it at all. Builders and tradesmen often promise more than they can deliver, but there are those who just prove to be useless. They take the money for the job upfront, and if they show up – several don’t – they do such terrible work that you need to bring in someone reputable to correct all the mistakes they’ve made. Unfortunately, builders and tradesmen in general get tarred by the brush of these rogue traders, so that genuine workmen become suspect. Rather than becoming a victim – and there are tens of thousands of complaints every year – the best thing to do is to avoid the rogue traders altogether. 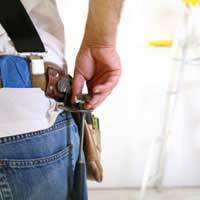 There are some simple steps you can take to sort reputable builders from the cowboys. Avoiding rogue traders is actually fairly easy. It means not falling for promises and a smooth line of patter. What you need to do instead is put in a little research work – but remember, it’s all for your own benefit in the long run. The first thing to do is check whether the builders or tradesmen belong to any association. The National Federation of Builders, TrustMark, the Federation of Master Builders and Quality Mark Builders are all recommendations of quality and those on the lists are trusted tradesmen. Ask friends and family who’ve had building work done for recommendations, the names of good, reliable builders. When you do come up with some names of workmen, talk to them all, ask for references, and make sure you get several written quotes for the work you want – don’t just go with the first bid you receive. Never pay in advance, and never pay in cash. You can agree stage-by-stage payments with the builder, and you should ask for a warranty from the builder on his work, backed by insurance, and have him provide written specifications and quotes for what you want done to avoid later problems. Where the work is complex, have plans drawn up by an architect. With trusted tradesmen, this should present no problem, they’re professionals and as such want to keep their reputations. All of this should help eliminate the rogue traders. It won’t work in every single case, but in the vast majority of instances, precautions like this will keep the cowboys at a distance. Rogue traders will want you to sit down in your home and sign a contract. Remember that any contract worth more than £35 signed in this manner gives you a seven day cooling off period in which to change your mind (unless you invited them to call, for instance by responding to a leaflet or phone call). If you’re not given details of this right, then any goods and services already supplied – if you cancel within the seven days – don’t have to be paid for. If details are given and you change your mind about proceeding with the work, you must keep any goods safe for the company to collect, and in the case where work has already begun, you must pay for the amount already completed. Where the work isn’t of a reasonable standard, complain to the builder. If that brings no resolution, and the tradesman is a member of an association, take your complaint to them. If you feel you’re the victim of a rogue trader, take your case to Trading Standards, who are generally vigorous in pursuing such cases. If the work is obviously substandard, then you can also take the builder to court. Depending on the amount involved, you can go to small claims court, which offers an easier option to try and reclaim your money. All of that, of course, presents problems. The simplest solution is to just say no to builders who come around looking for work – they’re the rogue traders. The real workmen have no shortage of jobs. @nita - do you have his details? I think I would be taking him to court in order to regain your costs, especially if he has mislead you in this way.